There’s plenty of fun to be had in this episode, including parodies of the war films The Great Escape and A Bridge Too Far. After insulting a bunch of high-ranking Nazi officers at the Eagle’s Nest hideout in Bavaria, Booga has been imprisoned in Coldtitz Castle and vows to escape. He notices a British prisoner emptying dirt out of his trouser leg – actually he has just crapped himself, but he is impressed by Booga’s way of thinking. However, can Jimmy the Snitch be trusted…? Meanwhile, Barney makes contact with a British officer, Colonel Prentice Merton (who looks like a balding Mark Bonnar). You can tell he’s British, because he wears a bowler hat, smokes a pipe and carries an umbrella. He tells Barney that they must prevent the Germans from blowing up the Bridge at Arndale. If that’s not enough for you, Tank Girl takes control of an even bigger tank (a German Jagdtiger heavy tank destroyer this time) and Booga makes use of his natural kangaroo jumping ability. But the funniest bit for me is when Barney has the idea of sneaking up on the Nazis with the aid of a pantomime horse and a gorilla costume. The result looks like an am-dram version of Planet of the Apes, which made me laugh out loud. This series also carries a spoof one-page advert (which has appeared in both issues so far) for a crappy toy soldier set, “Made of inferior plastic, each with its own problem … Have your boys come home in a box”. 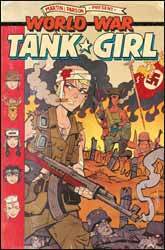 World War Tank Girl, huh! What is it good for? Quite a lot, actually.